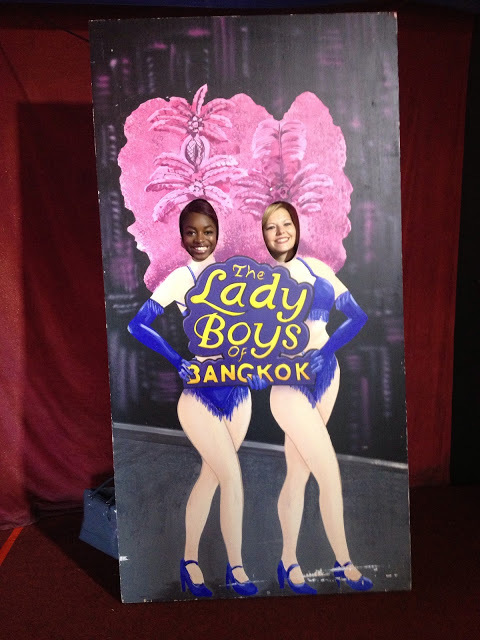 So on Monday I was invited to go see The Lady Boys of Bangkok down at the beach. I was pretty intrigued to go see what it was all about and my friend Kate was ecstatic when I asked her if she’d like to come. The performance itself is in a pavilion where there is also a little beer garden set up, a gift shop, an authentic food stall where you can grab you dinner and last but not least two bars! Our table was right at the front so I was in prime picture taking position! I have to say I really enjoyed the show, I wasn’t quite sure what to expect but it was really entertaining! The Lady Boys mimed along to a selection of songs old and new and went through a variety of dance routines that would put Beyonce to shame. There really was something for everyone. I spent the whole time envying the costumes, Kate spent it manically clapping and singing along and the couple next us to us spent it occasionally scowling over at us and looking bored out of their minds – they were quite the party poopers. I don’t really want to give too much away but throughout the show unsuspecting victims were dragged on stage. At one point a man who had reluctantly made his way to the stage was pinned down and straddled for all to see. He was so embarrassed he grabbed his bottle of wine and stormed out which Kate and I found pretty hilarious. If I had to give a down point I’d say I wished there could have been more interaction from the Lady Boys, they barely spoke – if at all – the whole show. But apart from that it was a really good laugh and I thoroughly enjoyed it, it was definitely something different that’s for sure! They’re touring throughout the UK so there is still plenty of time to buy tickets! Kate is going again next week, she’s in love with one of The Lady Boys but shh don’t tell anyone! What about you guys? Have you been to see The Lady Boys? Would you be interested in going? Let me know!